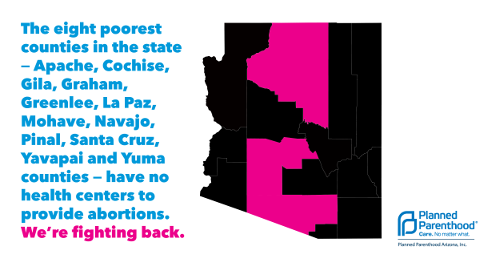 On Thursday, April 11, women’s reproductive health-care providers filed a federal lawsuit seeking to remove Arizona TRAP (Targeted Regulation of Abortion Providers) laws that prevent and delay many women from accessing abortion. The lawsuit was filed by reproductive health-care provider Planned Parenthood Arizona and individual clinicians represented by O’Melveny & Myers, Planned Parenthood Federation of America, the Center for Reproductive Rights, and Squire Patton Boggs. 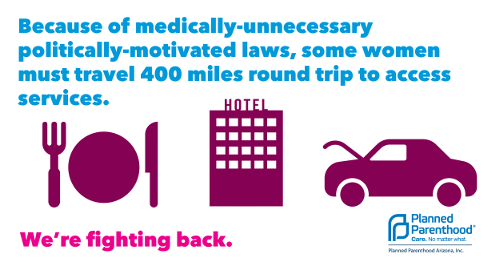 Arizona’s extreme, medically unnecessary TRAP laws violate Arizona women’s constitutional right to access legal abortion. Their effect has been dramatic: a 40 percent decline in abortion clinics, leaving 80 percent of Arizona counties with no access to abortion clinics, and weeks-long waiting times for services. There is only one abortion provider in the northern part of the state, and that health center only provides medication abortion one day per week. a telemedicine ban that prevents access to early abortion services in remote areas. Medically unnecessary laws have essentially stripped abortion access from many women living in Navajo, Hopi, Hualapai, and Apache tribal jurisdictions, among others, as well as rural women in other regions of the state who already face many barriers to accessing essential health care. Allowing qualified medical professionals to prescribe pills for abortion via telemedicine would expand access to women in underserved areas. Medication abortion has been available in the U.S. for many years and is extremely safe — the complication rate is less than 0.5 percent, according to the Guttmacher Institute, whether provided in-person or by telemedicine. Telemedicine has been widely embraced in Arizona and across the nation as a high-quality health-care option. In fact, the Legislature has promoted the use of telemedicine to provide other health-care services, including treatments for trauma, burns, cardiology, pulmonology, infectious diseases, and neurologic diseases — even strokes. Permitting qualified clinicians to provide abortion services would also help expand access. Abortion is the only medical procedure that the Arizona Legislature has specifically banned trained nurse practitioners and physician assistants from providing, even though they can provide medically identical procedures in miscarriage management. This entry was posted in Arizona News and tagged abortion, abortion pill, Apache, Arizona, Bryan Howard, Catalina Vergara, Center for Reproductive Rights, Deanna Wright, evidence-based medicine, Guttmacher Institute, Hopi, Hualapai, lawsuit, Leana Wen, mandatory waiting period, Marc Hearron, medication abortion, Native Americans, Navajo Nation, O’Melveny & Myers, Planned Parenthood Arizona, Planned Parenthood Federation of America, rural health, Squire Patton Boggs, Targeted Regulation of Abortion Providers, telemedicine, TRAP law, TRAP laws by Planned Parenthood Advocates of Arizona. Bookmark the permalink. 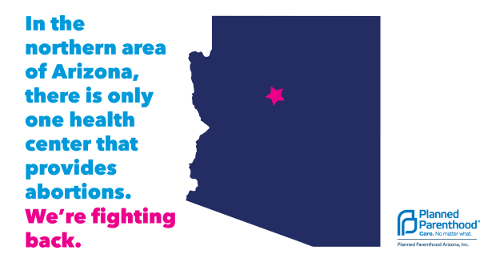 This Saturday: Stand With Planned Parenthood Arizona!